Is iGallery really the best app in Photography category? iGallery (was InstaMaster) is an excellent app that provides the best Instagram experience. Besides viewing feeds and popular and nearby photo/videos, you can also upload photos to Instagram directly from your Mac. iGallery needs a review. Be the first to review this app and get the discussion started! Note: Due to an Instagram limitation, iGallery only can upload square photos. Our app will convert those non-square photos to square automatically and this might affect photo quality a little bit. You can crop the photos to square manually and then use our app to upload, so that photos quality will not be affected. Please refer https://goo.gl/6W4deH for how to crop photos with Preview.app. 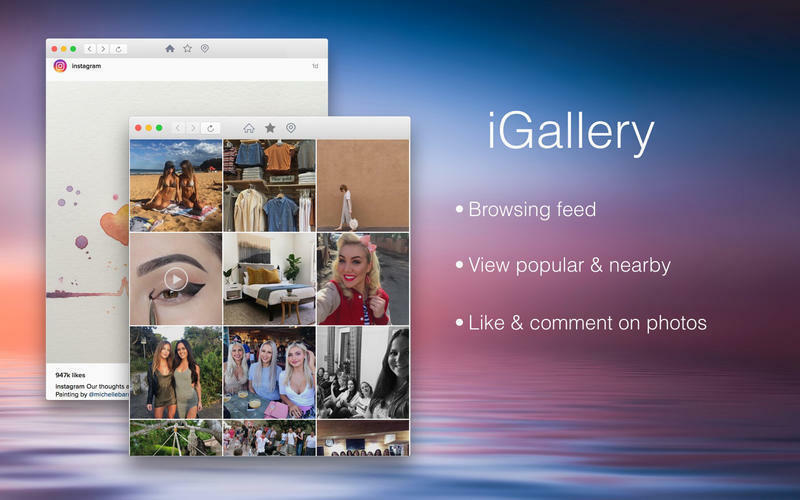 Legal Note: iGallery is a 3rd-party app, and is not affiliated with Instagram what so ever. Instagram and its logo is trademarks of Instagram LLC.